Hardcoating Technologies (HTL) produces high-performance PVD (physical vapor deposition) coatings for cutting tools, punches, forming tools and mold components. Today’s leading companies use PVD coatings to achieve dramatic gains in productivity. Hardcoating Technologies understands and is very familiar with the quick turnaround required by the companies involved with coated parts. At Hardcoating Technologies, our service is dedicated to the quickest turnaround times possible. Hardcoating Technologies is uniquely experienced with the delicate handling techniques required for brittle tool materials such as tungsten carbide. 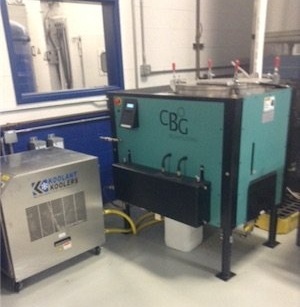 "We installed our CBG PW series Solvent Recycler with our new vapor degreaser. Using the Continuous Feed option enables us to have clean solvent in our vapor degreaser all the time. Dirty solvent is pulled from the degreaser to the CBG system. It distills the dirty solvent returning clean solvent back to our degreaser. The solvent in the vapor degreaser system is always like new. This enables us to have pristinely clean parts coming out of our system always. This is very important to our PVD coating that is applied to those parts. If the parts are not cleaned perfectly the coating does not adhere." Reach out to start the conversation with the experts at CBG Biotech.